School is finally out and the summer is on its way. Along with the graduation parties, barbecues, and summer recreation, the sunny season brings a rise in injuries. Sources ranging from the U.S. Consumer Product Safety Commission to hospital emergency rooms confirm that accidental injuries swiftly increase during the summer months, and many of those are preventable. Children are the most likely to get hurt in the summer months but adults are not immune. Kids often roam with less supervision once school is out while many adults switch into vacation mode, exercising less caution or enjoying an alcoholic beverage while kicking back at seasonal gatherings. 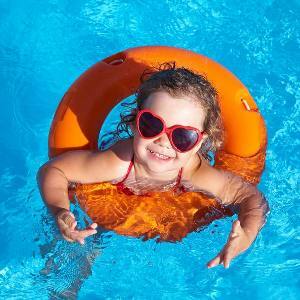 Swimming pools – drownings spike every June and July. The rise is greatest in children but the number of adult drownings rises as well. Life-changing diving injuries also increase; these make up nearly 5% of all spinal cord injuries. Playground equipment– kids naturally use playgrounds more in the summer, having more free time and agreeable weather draws flocks of children to the jungle gym. The biggest prevention is to only let kids play on playgrounds while supervised, and to first check that the equipment appears safe and in-tact. Bicycles – there is a reason children and adults alike should wear a helmet on a bicycle. Riding a bike puts one in the perfect position to sustain a traumatic head injury. Broken bones such as wrist fractures are also common. Lawn mowers – A lawn mower may not be a first guess as a summer injury hazard but emergency room personnel see a definite hike in mower-related injuries in the summer months. Children too often treat a riding mower as a ride-on toy. Adults suffer cuts or amputations when they mow the lawn while wearing sandals or the mower hits an object like a rock. Sun exposure – From severe sunburns that can cause cancer to heat stroke or dehydration, exposure to the hot summer sun can lead to serious injury. The risk can be minimized by covering up with sunscreen and a wide-brimmed hat, limiting the time spent in the sun, and drinking plenty of water. Sometimes accidents just happen. Other times, someone or something is at fault. If a person or business is obligated to do or not do something but breaches that obligation, they may be negligent if the breach leads to injury. If a product has a defect that contributes to the damage, its manufacturer or distributor may be liable under product liability laws. In cases of negligence, victims have rights and may be entitled to compensation that can include reimbursement for medical expenses and lost wages as well as payment for emotional distress, lost companionship, and pain and suffering. Every accident has its own story that affects the victim’s right to compensation. The best way to know if you are eligible for compensation is to contact a Maine personal injury lawyer for a free consultation. Hardy Wolf & Downing has been fighting for the rights of injury victims in Portland and throughout Maine for the past 40 years. For a free consultation, 1-800-INJURED.